If you go up to the woods today . . .
Sally Oldaker meets a Barnt Green artist who creates vibrant images in an intriguing medium. The tagline on Emmanuel Yaw Obuobi’s website reads, “You won’t believe it’s all yarn”, and this is very true: until you get up close to one of his artworks, you might think it had been created with pastels or paint instead of with fine strands of wool. The intricately-crafted pieces have an almost Impressionistic quality, with quite astonishing depth and movement created by clever use of colour, light and shade. Emmanuel, who grew up in Ghana before emigrating to Canada and finally settling in Barnt Green in 2009, has been working with yarn for about 30 years after switching to the medium from the more conventional watercolour and acrylic. Having trained and worked as an architect, he only painted in his spare time – but eventually he decided to concentrate on art full-time. And with ambitions to get his work into the international market, he needed to do something to make it stand out from the crowd. “I experimented with different materials to get a 3D effect – cereal, grain, sand, even tree bark – but settled on yarn because of the variety of colours and textures,” he recalls. Back at the beginning of what he calls his journey, he could not have imagined that one day he’d be presenting a portrait of Queen Elizabeth II to Prince Charles – but that’s exactly what happened when he exhibited said portrait and many others at the Ideal Home Show in London this spring. 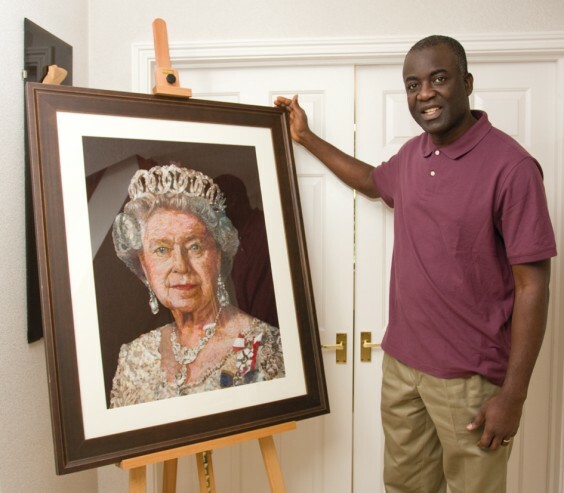 “I wanted to do a picture of the honourable lady for her Diamond Jubilee, and I was very proud to be able to present it to her son,” says Emmanuel. He told the Prince of Wales that he’d love to present the piece to the Queen herself, and a royal aide is “on the case” to make this happen. It wouldn’t be the first time he’s rubbed shoulders with the Royals, having previously presented his portrait of Camilla, Duchess of Cornwall, to her at Clarence House. 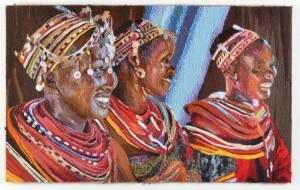 The incredibly detailed rendering of the Queen’s distinctive visage and sparkling jewels represents the latest level of development for Emmanuel, whose work grows more intricate with every piece – looking at his early work, the yarn is thicker and the detail less fine, but now he separates each piece of yarn into thinner strands to achieve that fine detail. Using a piece of particle board as his canvas, Emmanuel starts by sketching out the image in pencil, before applying industrial glue and positioning each strand in place. He occasionally works from photos, but usually begins with a sketch and often gets his wife and kids to pose with various facial expressions to help him capture a certain emotion. It takes about two weeks to complete a smallish piece. Many of Emmanuel’s pictures depict scenes from his early life in Ghana, such as a young boy with a catapult, a bustling village market and images of traditional musicians and storytellers. “Storytelling is such an important aspect of life in Ghana – villagers gather round in the evening to hear tales of their ancestors, usually involving music and dance,” explains Emmanuel. However, he enjoys mixing various cultures into his work; some figures will be wearing South African clothing but playing West African instruments, and the symbols in the background are often of his own invention. Yarn seems to be the ideal medium to evoke the vivid colours and emotions of African life, and Emmanuel says he’s a perfectionist about getting the facial expressions just right – whether it’s musicians in mid-song, the movement of whirling dancers or the troubled faces of young siblings who have lost their parents. This is one of three currency pieces created by Emmanuel, the first being a Ghanaian note which so pleased the Bank of Ghana that they commissioned him to repeat it as a mural at their HQ. He also did a US 1000-dollar bill featuring a portrait of Martin Luther King. Emmanuel particularly loves doing portraits, especially of children – an image of his own daughter was entered into the National Portrait Gallery’s annual competition in 2010, but unfortunately they only accept paintings in conventional media. His art has certainly had plenty of recognition abroad, with 15 exhibitions in the US as well as Canada and Ghana – and what could be more indicative of acceptance into British society than presenting portraits to the monarchy? Other collections include colourful abstracts and typical English wildlife, such as the beautiful peacock piece entitled Roots and Elegance (“roots are important – otherwise there is no meaning behind the elegance”). He shows me two identical-looking pictures of a kingfisher in flight, and invites me to guess which is the original and which is the print. From a couple of feet away, it’s impossible to tell – it’s only when you step really close than you can see the actual threads in the original. He explains that he went to great lengths to achieve high enough quality prints of his work, engaging a photographer from Birmingham and a printer from Bristol who could print on to textured paper. These prints, which retain the three-dimensional quality of the originals, are currently on sale at Artyfacts in Bromsgrove (they do his framing), as well as http://www.saatchionline.com and his own website. Emmanuel will be exhibiting at Bromsgrove’s Artrix in December – and in the meantime, it’s possible to make an appointment to view the work at his home.